Most people also know that Albuquerque is in New Mexico, and that New Mexico is one of the 50 states, although when I was a kid New Mexico magazine had a very popular back-page feature called “One of Our Fifty Is Missing” that chronicled ignorant Easterners’ attempts at changing dollars for pesos at the Albuquerque airport, or worrying about getting visas, or hoping to buy prescription arthritis drugs for el cheapo. I have yet to meet anyone who actually didn’t know New Mexico was a state; I suspect the stories might have been made up. Here on the East Coast, when I tell people I’m from New Mexico they almost always say “Oooh, New Mexico” and get a faraway look on their faces. Then they start talking about a vacation in Taos, either one that they’ve taken or one that they want to take. “Albuquerque” is very hard to spell. I learned to spell it in second grade by chanting the letters in a singsong rhythm, like I imagine you might memorize large chunks of some sacred text. I still consider spelling “Albuquerque” a special skill, like juggling, that differentiates me from people who’ve never taken the time to learn how to do it. With its ungainly name, Albuquerque doesn’t lend itself to popular song. The only two songs I know of about Albuquerque are Neil Young’s “Albuquerque,” which is really a great song but has a pretty strange rhythm, and “Point Me in the Direction of Albuquerque” by the Partridge Family. That’s not such a great song, and they have to try too hard to fit the word “Albuquerque” into the musical line. Neil Patrick Harris, TV’s Doogie Howser MD, grew up in Albuquerque. He went to La Cueva High School, which we considered the snooty new school in the rich part of town. Freddie Prinze, Jr. grew up at least partly in Albuquerque. (By that, I don’t mean that he hasn’t fully grown up — I’ll assume he’s as grown-up as most of us in the absence of evidence to the contrary — but that I think he only spent part of his youth there.) In this week’s Star I read that Steve-O from Jackass grew up in Albuquerque and is only a few months younger than I am. I probably know somebody who knows Steve-O, though I’m not sure who. The Shins formed in Albuquerque, although apparently they don’t live there anymore. Growing up in Albuquerque, I identified a lot with Luke Skywalker (well, maybe that’s because I was a dorky white kid in the ’70s) when he said about his home planet of Tatooine, “If there’s a bright center to the universe, you’re on the planet that’s the farthest from.” Albuquerque seemed very far from anything interesting. Doogie Howser came along relatively late in my childhood, and even that wasn’t that exciting. And anyway, it was filmed in L.A. and set someplace like Chicago, wasn’t it? Even worse than being boring, Albuquerque was different. It’s dry, so it doesn’t look like all the storybooks about life on the East Coast or in England, but it’s not the kind of desert that has saguaro cactuses or sand dunes. (In fact, it gets slightly too much annual rainfall to be a true desert. It’s semi-arid. What the hell kind of city is semi-arid?) And it has odd seasons: not hot year-round like Phoenix, but the winter manages to be both mild and bone-chilling due to really big temperature fluctuations between day and night. Anyway, it bothered me a little that Albuquerque was so physically unlike all the places in the books I read. I think racism played a part in my sense that Albuquerque was odd, too. I didn’t dislike the Hispanics who made up the majority at the schools I went to, but I felt different from them, and when I was a child that resulted in a subconscious desire for them to go away, or for me to go away to some more Anglo place. And of course, there aren’t many Hispanics in the Sherlock Holmes stories I was constantly reading and by which I judged reality. It wasn’t until late in high school that I read Rudolfo Anaya and Willa Cather’s powerful literary evocations of New Mexico’s unique Hispanic culture. I moved away from Albuquerque at 18 to go to college and, except for a couple of summers, haven’t spent long periods of time there since. A turning point for me was a few years ago when I visited Albuquerque with a group of friends who are also from the West but were mostly living on the East Coast. Seeing my hometown through their eyes, I started to appreciate its laid-back atmosphere, its casually blue-collar honesty, its sometimes jarring but ultimately charming mix of banal suburbia, mid-century kitsch, and desert sublime. It’s also kind of fun. We went to a glorious tiki bar on Central Avenue that has an old Hawaiian man playing keyboard and singing “Tiny Bubbles” every Thursday through Saturday. We went to another bar closer to the university for its margaritas. A couple of years later, I was in Albuquerque on a business trip and took a couple of female coworkers to that same bar; we were hit on (as a group) by a couple of swingers who — I swear to God this is true — wanted us to go back to their hot tub at their home near Kirtland Air Force Base. More recently, and less creepily, I chatted with Ira and Georgia of Yo La Tengo about the glories of a particular greasy-spoon Mexican place downtown. I was mostly recently in Albuquerque this last October. 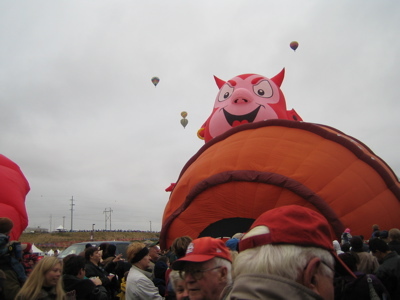 My siblings and I had picked a weekend during the Balloon Fiesta to converge on the city and make my mom happy with family togetherness. We all got up excruciatingly early to go see the balloons launch on a Friday morning. After parking the car in a vast field in the far northeast of the city, my brother and I walked down to the launch field to meet everyone else. It was probably 5:30 or 6 in the morning, mostly dark, pretty cold. But in the high (semi-)desert at that time of year, some plants are still alive, and they open their pores and their flowers at night to take advantage of the absence of the drying sun. The most incredible smells rushed up to meet me as I walked, the scents of moist, cold earth, sagebrush, and some kind of sweet flower. Subtle, surprising, strange, utterly unlike anything Sherlock Holmes ever smelled in his life. beautiful beginning dave. wow. such precision, such focus. nice meditation on where you come from. glad stephanie shared. good stuff, i will pass the site on to mark. There’s also “The Lights of Albuquerque” it plays everynight at closing time at one of the local bars, so I’ve heard it a lot :P I’m not from ABQ, but I’ve lived here for the past ten years or so – I love the seasons here more than anything else. I’ve lived all around the Western U.S. and ABQ is probably my favorite town, Portand OR, and Los Angeles CA are close, but don’t quite make it ‘cuz they have very boring seasons. The only places I didn’t like were Phoenix AZ, far too hot, and Salt Lake City, UT (where I’m originally from) because of it’s local theocratic tyranny and it’s very cold winters.